but how export him ? possible to help me ? You can use GIMP to convert the .rgb files to PNG, use Assimp to convert the AC3D files to .obj, then import the obj file in Blender. You might have to re-texture everything though. But i have a problem with textures :/ Possible to help me ? 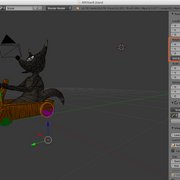 Go into the UV editor with the object in edit mode. click on the folder symbol (at the bottom) and navigate to your texture (use the png texture). Also make sure that you use texture or solid shading, to see if it works (If you use solid shading you have to enable textured solid). Possible to help me for this ? Select in edit mode one of the wheels (you can use "L" ). Then press "P" and click "selected". Go in Object mode and select your wheel click "set origin", "origin to geometry". Repeat this for the other wheel. And now you can change the positions of the wheels. 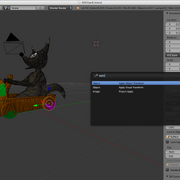 I have an another question, i have add an object for nitro, but when i exported the kart, i can't see the object, why ? Nitro emitters are invisible in-game. If you want to have an actual exhaust pipe, it has to be part of the kart. Please read the documentation thoroughly before posting questions. Also, take a look at the karts in the media repository to get a more visual idea of how things work. 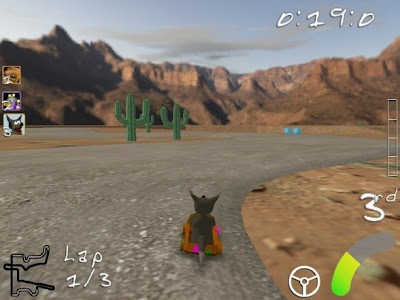 Put my kart in center, put my 4 wheels but when i play, he move. Since two days now, I try, i test, i try, i test, i try .... But it's same :/ What is the problem ? anyone have an idea for this bug ? I haven't tested it, because I have not currently installed the STK Blender add-ons, but I believe you have an incorrect pivot point on the wheels. The pivot point indicates the center of a 3D object. 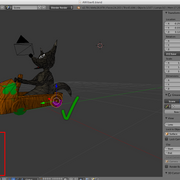 You notice the transform arrows are below the actual 3D mesh if you select a wheel of the kart. That's where your current pivot point is. The wheel will rotate around this point, so let's bring it to the center of the mesh. In the tools panel [T] there is an option "Set Origin", which can set the pivot/origin point. Select "Origin To Geometry" [Shift-Ctrl-Alt-C] for centering it according to the geometry. Select the wheel in the 3D view and hit [Space], to open up the search input. Type in "apply" and you'll find an option called "Apply Object Transform", click that. This will open up an options menu in the in the tools panel. There you can select what transform should be applied. Select "Rotation". Your wheel should now have a correct position of the pivot and a correct transform. Hope that helps. Let me know how if you have further problems. 3 - The texture of light and Nitro don't work, why ? There's many blends in there. I looked at "AWilber14.blend"
"1 - The Nitro emitter don't work, however, I did as the tutorial"
"2 - The light is on even when it's light "